The Ultimate in Noise Canceling! - Headsets Direct, Inc. The Ultimate in Noise Canceling! Plantronics introduces the Ultimate Headset for Noise Canceling! 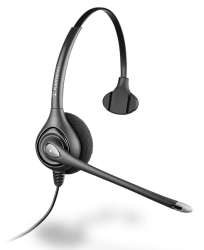 The Plantronics H251N-UNC Supra Plus Headset with ULTRA Noise Canceling Microphone is the newest addition to the Supra Headset Line. This is sure to make any call clearer, louder and more enjoyable for yourself and your listener! You will no longer have to worry about the copy machine being too loud, the music from your co-workers stereo or just the general office chatter, the H251N-UNC will cancel all of that extra noise out for you! Combine your H251N-UNC with the Plantronics M22 Amplifier for even clearer sound. For the ultimate in comfort try out the Plantronics 67712-01 Leatherette Ear Cushions.